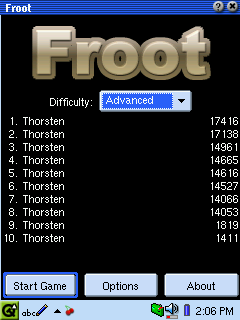 You will probably like this game if you like Frozen Bubble. "Clear a playing field full of fruit before they reach the bottom." Superb games are often recognized by their exceedingly simple rules. Froot certainly, is in this category. It is simple yet addictive. In this game you have to remove a lot of fruits from the game board by shooting new fruits at them and thereby forming assemblies of the same sort. If you succeed in this they (and all connected ones) fall off the game board making more room. 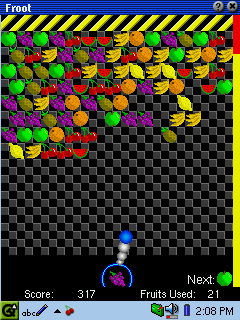 Various levels and an increasing level during game play keep your interest if you get better and better at shooting fruits. Froot follows the idea of the highly praised Gnome game Frozen bubbles and manages to implement the same catching game play feeling. It certainly is a game which keeps you playing for a long time and can be thouroughly recommended.